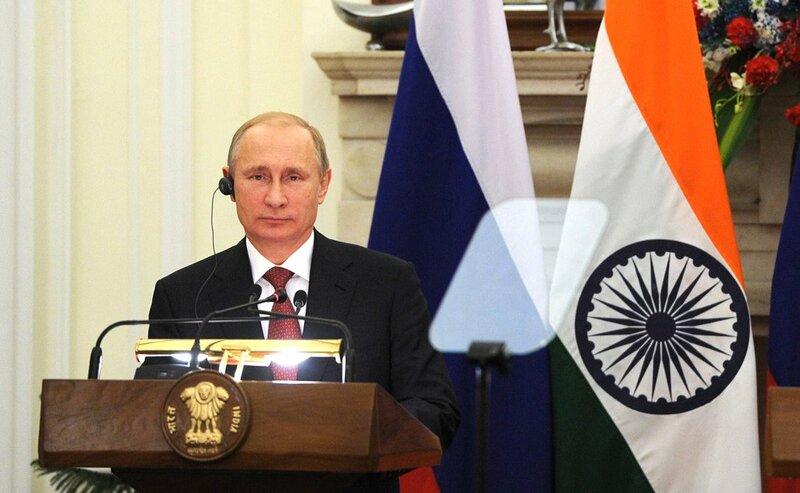 Vladimir Putin during his visit to India in 2014. Russian-Indian relations can be qualified as privileged strategic partnership. As to the economy, a perfect example of this point is cooperation in atomic energy, in particular, the construction of the Kudankulam NPP. What other areas of Russian-Indian cooperation can speak to a similar success? India is Russia's especially privileged strategic partner. Cooperation between our countries is making good headway in all areas on the basis of strong traditions of friendship, trust and mutual respect. The two countries maintain active political dialogue, with summits taking place every year. The Inter-governmental Commission on Trade, Economic, Scientific, Technical and Cultural Cooperation is also working efficiently. Our foreign ministers, heads of staff of security councils and line ministries keep in touch on a regular basis. There is a gradual increase in inter-parliamentary, inter-regional, business and humanitarian exchanges. We have developed a strong legal framework featuring over 250 agreements. India has been and remains Russia's major foreign trade partner. Even though trade between the countries dropped by 7.8 percent in 2015, together with our Indian partners, we are resolved to overcome the negative trend, which, in our opinion, is largely associated with volatility on the global markets and in exchange rates. Especially since our commercial exchanges are mutually beneficial and their structure shows the complementarity of the two economies. Chemicals and engineering products account for a considerable share of Russia’s exports and the exports from your country. Rosatom State Atomic Energy Corporation and the Nuclear Power Corporation of India began preparations for the construction of units 3 and 4. Works are being carried out according to the agreed schedule. The project is implemented with funding from the Russian Federation. The government loan stands at $3.4 billion, or 85 percent of the total value of contracts concluded with the Russian organisations. We are now working on the localisation of component manufacturing in India. We began assessing the construction of nuclear power plants at other sites in India. Technological cooperation in the field of uranium enrichment is being established. Our countries actively collaborate in the military technical field. Russia remains in the lead in terms of both direct supplies of most advanced weapons and military equipment and conducting joint research with India, as well as producing goods for military purposes. Construction of the BrahMos supersonic cruise missile and development of a new, fifth generation fighter aircraft are among the successful joint projects. Let me add that many of the Russian projects in India not only have commercial importance but also play a significant social and economic role for the economies of the two countries. They harmoniously fit in the new Indian industrialization programme proposed by Mr Modi. The level of investment cooperation is one of the criteria of reliable bilateral relations and trust between countries. In this regard, what steps are planned to be taken in view of the upcoming Russian-Indian Summit? Will the plans to privatise Russian companies influence the development of the investment partnership between Russia and India? Naturally, during our visit to India we hope to give fresh momentum to the bilateral trade and economic ties, given that the companies of both countries are interested in implementing new mutually beneficial projects. Russia's cumulative investments in India amount to about $4 billion, while Indian businesses have invested twice as much in the Russian economy – about $8 billion. I am convinced that Russia and India can considerably boost bilateral investments. To stimulate mutual investments, we plan to discuss with our Indian partners the possibility of updating the bilateral Agreement for the Promotion and Mutual Protection of Investments. We encourage the development institutions – the Russian Direct Investment Fund and Vnesheconombank – to be more active in providing financial support for investment activities of the Russian companies. To date, 20 priority projects have been selected – 10 Russian projects and 10 Indian ones – in such spheres as transport engineering, chemical industry, aircraft industry and pharmaceuticals. They include the construction by the SIBUR Holding of a butyl rubber facility with an operating capacity of 100,000 tonnes per year in the city of Jamnagar, and production by Russia’s Lighting Technologies Company of lighting equipment for general and specific purposes in the city of Jigani, Karnataka state. The Sistema Financial Corporation is developing a ”smart city“ model in India. Dauria Aerospace is working on the deployment of the NextStar telecommunication satellite constellation in the geostationary Earth orbit. The two countries’ governments will assist in the implementation of these projects. BRICS summits have been already included on the global agenda, and are held regularly. Yet, the final declarations only slightly differ from summit to summit. What do you think is essential in order to make BRICS cooperation more substantial, effective and concrete? BRICS is one of the key elements of the emerging multi-polar world. The five countries have consistently reaffirmed their commitment to the fundamental principles of international law and promote the central role of the United Nations. Our countries reject the policy of coercive pressure and infringement upon the sovereignty of other states. We take similar stances on urgent international issues, including the Syrian crisis and the Middle East settlement. Our countries actively cooperate within the Group of 20, including under the current Chinese chairmanship. Thus, the BRICS countries have undertaken a commitment to implement the Action Plan on Base Erosion and Profit Shifting. We seek to systematically converge our stances in the WTO with a view to improving the rules and spurring multilateral negotiations within the organisation. What proposals are you going to make at the forthcoming BRICS Summit and what do you expect from this meeting? What do you think the participants in the association could claim as their achievements after this meeting? What other projects beside the New Development Bank, could serve as a proof that this cooperation format is valuable? First and foremost, I would like to express gratitude to Indian leadership which has, invariably throughout its chairmanship in BRICS, focused on strengthening and consolidating the strategic partnership within our association. I am convinced that the Summit in Goa that will be held under the slogan of continuity and innovation, will be very fruitful. You often mention the necessity to interlink integration processes, particularly those of the EAEU and the Silk Road Economic Belt. How could the current BRICS format be used to implement such initiatives? The global economic and financial situation remains difficult, with the consequences of the global financial crisis still persisting. It is therefore regrettable that certain countries seek to solve the problems that have built up by introducing protectionist measures and trying to engage in restricted non-transparent projects, such as the Trans-Pacific Partnership or the Transatlantic Trade and Investment Partnership. Russia, just like all its BRICS partners, remains committed to shaping open non-discriminatory economic areas based on the WTO principles. Let me remind you that on July 9, 2015, Ufa hosted an outreach meeting with participation of heads of state of the Eurasian Economic Union, the SCO, as well as the SCO observer states. Among other things, the participants discussed the issue of major regional and trans-regional infrastructure projects. When you think of the territory from India to the Russian border you realise that the situation there is rather complicated, with numerous problems and contradictions. What challenges and issues, in your opinion, will be the most important and acute for the countries of the region in the next ten years? The situation on the territory between India and Russia remains tense. In particular, the developments in Afghanistan still raise concern. Decisive actions are required to help that country in dealing with such challenges and threats as terrorism, extremism, and illicit drug trafficking. Russia and India share the need to support national reconciliation efforts under the international law and are interested in deepening constructive multilateral cooperation for the purposes of assisting Afghanistan in solving the issues of national security, building counter-narcotics capacity, ensuring social and economic development, and enhancing interconnectivity.